In the last two years I’ve been putting food on the table and paying the rent via freelancing. I’ve done this as a freelance journalist, writer, photographer and speaker. In addition I’ve worked with IT in the form of development, lectures, user training and system analysis. First and foremost with collaborative solutions, but also with other IT solutions, and efficient use of email and calendar. I will still be doing this, but my career as a 100% freelancer will now come to an end. As I’m sure a lot of you know, I do a lot of presentations and lectures, as well as giving courses and doing user training. 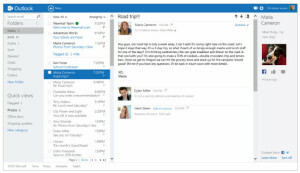 I’m especially doing a lot of this kind of work when it comes to collaboration and efficient use of email and calendar. 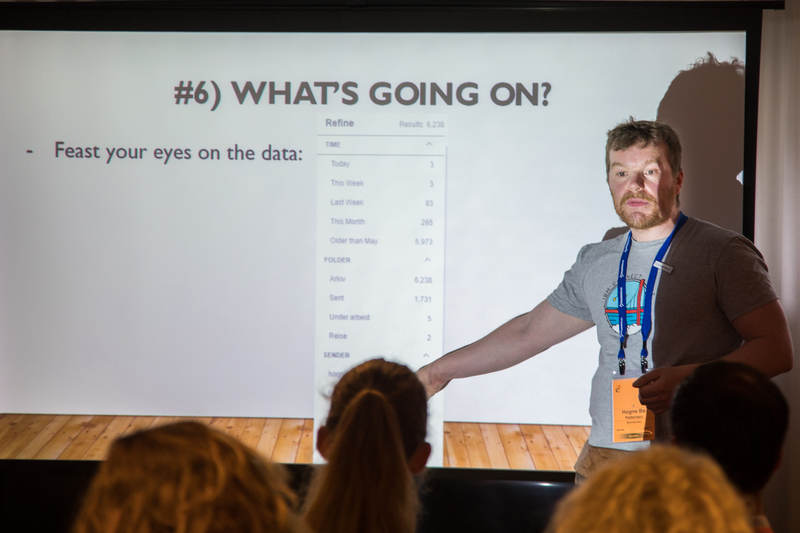 If you want me to come and have a look at your organisation and make you less dependant on internal email, make it easier for your organisation to find information and documents and help you find the knowledge and skills that you have in house, please get in touch! Summer holiday and a huge load of journalistic assignments made me postpone and postpone, and postpone yet again, my summary of the Norwegian IBM User Group’s spring seminar, which took place at Farris Bad (a spa resort) at the end of May. I will therefore here do a short summary of the last sessions I attended. Joar Lyngaas (now retired, I’m told) from IBM talked about content management within IBM Connections. In my company, we use FileNet and CCM. This makes it possible to define document types with meta data, as well as creating a work flow for reviewing documents before being published. What Joar went through went deeper, and for my company, which is very much looking at a content management system for our documents, this was very interesting. 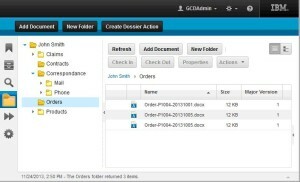 Another important factor here is IBM’s Content Manager, which we now will be able to use for administering the various document types, and it will also give us a widget/app that will work both in Microsoft Office, in IBM Connections and even in a widget IBM Notes. This session was the most useful for me during this seminar, and we have already invested in three development licenses. 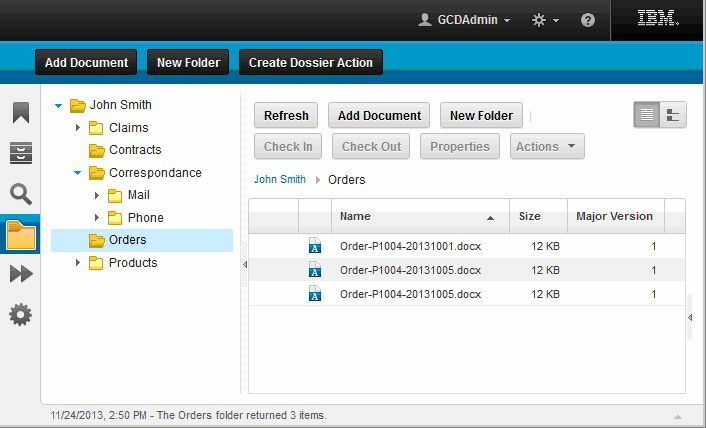 We will make web versions of our biggest IBM Notes applications, and via the API for CECE, we will probably use it for storing of attachments and files and other documents used in the sales and service process. Honestly, Bluemix and Xpages is something my company have decided not to pursue. We will be using Domino as nothing more than a platform for storing the data, and then we will use the REST API in Domino to get the data. Alan Hamilton from IBM then talked about one of the biggest challenges Social Business adopters like me face: How do you do user adoption properly, and get people to use solutions like IBM Connections? But this also goes for adoption of any new system, because after 70% of the project budget is spent, that’s when you start user adoption. And neither time nor resources are enough at this stage. Vision: You need a vision when you start a project. You need to have a plan. What do you want to achieve with this project? Leadership commitment: Make sure the ones taking the bill are on board with what you are doing. Refer to business cases and tell them why this project is important and will increase your earnings and improve efficiency. Without leadership backing, you will get nowhere. Use Cases: Define what improvements and benefits you envision for your organisation and focus on them. Then define what improvements and benefits you foresee for the individuals in the organisation. The good old “what’s in it for me?” is something that the users will ask or wonder about. Define what’s in it for them and focus on that. Use examples on where you think things would be improved. Plan: Recognise that not all users are the same. Identify the early adopters, the ones that will be ahead of even you, the ones that need prodding and the ones that will never adapt no matter what you do. Plan how you will deploy the solution, how you will train your users and how you will support them. This session hit pretty close to home with me, as we are still going through them. Slowly improving, but not quite there yet. Runar Brastad from Item consulting did a very good presentation on how you can use the very open APIs in IBM Connections and the Social Business Toolkit to both fetch data from Connections, as well as post to Connections from external sources. This was a very interesting session, and I got several ideas that I’m testing these days. The plan is to replace our intranet with IBM Connections, and use the API’s to fetch data on to our own custom made start page, as well as to information screens that are in place all over our company. And that was it. Phew! One of the main reasons for using tools like IBM Connections is that you can share information with a lot of people at the same time, without having to use email. This means that the information is open for everybody who has access to it. This instead of being hidden in someone’s inbox, upon which you have to ask them to forward you a message, a file, a task and so on via an email. This works very well internally in your organization. It does not help you minimizing email contact with your customers, business partners, suppliers and other people outside your organization. In turn, this often forces you to use email instead of Connections also inside your organization since projects with external partners mostly also involves several internal people. In IBM Connections 5.0 you can get around this by inviting external users into communities on your IBM Connections server. If you do this, you can share information also with external people, without having to resort to email. Garbriella Davis from The Turtle Partnership gave a very good presentation of this during the ISBG meeting in Larvik. You can also set up self registration. 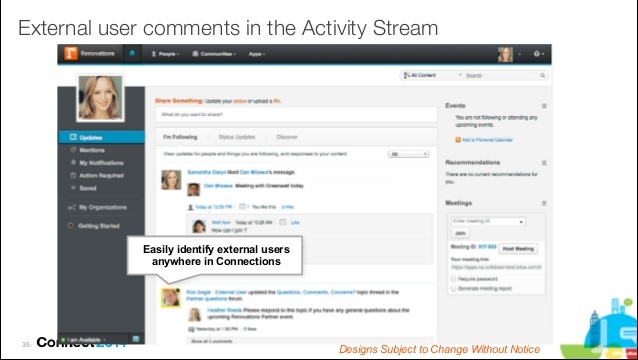 This means that you can create a community for external users and then send out invitations to join it. When the external user clicks on the link in the invitation, he’s asked to register. Domino is very good for self registration and there are Xpages based solutions for this. A community with external users can be converted into an internal community where no external users have access. Sharing information with external people does have its pitfalls, but I think these pitfalls are far outweighed by all the benefits. We all deal with files on daily basis. They are everywhere. In emails, on disks, in forums and on Facebook. I’m sure you’ve created at least one file today, or at least this week. But creating a file should be like planning parenthood. Are you sure you can take care of the file in the matter it should be taken care of? Are you sure it’s a good idea to create a file under the current circumstances? This was the topic of a session that Omar Davison from IBM gave at ISBG in Larvik last week (read my first posting from ISBG). He pointed out that a file is like a person, with certain uses, certain attributes and with connections to others. So, let’s look at a file as a child brought into the world. It will, hopefully, serve a purpose and generate value. When it’s born you spread the news and tell others about it. You can tell about via email, via a forum or in the newsfeed of a social media. You can also find the siblings of a file and put it in a family context. You put the file into a home in a community. Here it will meet people who will discuss the file and comment on it. Maybe they even will point others to it by sharing a link to it. The file will then learn and grow. People can edit it and work on it simultaneously. In this way the child is influenced by its surroundings and will grow and change. You can also choose who you don’t want your file to meet by denying selected people access. Or maybe you are bold and decide to share the file with someone external, outside your community. 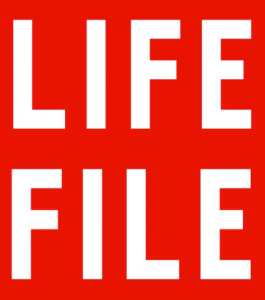 As the life of the file progresses it will reach a point where it’s usefulness is reduced. You then retire the file and put it in a folder, or a retirement home if you will. However, a folder is where files go to die, so don’t do this too soon. Files can have a long lifespan and be useful long after it has stopped growing. Because they will be read for a long time after being finished, they will be commented on, they will be liked and they will be spread. So if you want to make a file, take care of it, ok? Huguette Ranc, Social Business & Smarter Workforce Unit for Europe – IBM, talked about the strategic cooperation that IBM has with Apple, Facebook, SAP, Weather Channel, Twitter and other media outlets. IBM’s part of this is using Watson as a tool for analyzing the data. This is in turn used to create a better experience for the users, as well as gathering data that the companies use to decide on their future strategies with their tools. Christopher Crummey, Executive Director of Customer Experience and Evangelism – IBM Enterprise Solutions, then took the stage. He has been working at IBM for over 25 years, and he discussed the so called New Way of Working. The fact that the users have a huge influence and control over how they want to work, where they want to work and with what tools, had increased user satisfaction. IBM is the plumber and electrician, while Apple is the decorator. They use Watson to analyse the big data. This can in turn be used to find out about user behaviour. For instance did a huge analysis of customer data for a phone company find out that it was the weather that was the biggest catalyst for whether a customer switched cell phone provider or not. How could the weather influence such a decision? Further data analysis would be needed, but it could be down to the fact that a storm cut people from a certain provider off, while another provider was still online. The user would then change provider because of this. This underlines the importance of staying on top of traffic, user habits, purchases and other activities that generate data. Using this inside your own company is also a good idea. Make it easy for people to start working, to share ideas and to communicate. It’s especially important that the leaders in an organization leads the way here and invite everybody to start communicating. This will fuel engagement and drive innovation for your employees and users. Then it was lunch time. Stay tuned for more blog postings about ISBG in the coming days. I will also continue my Whither IBM-series. I’m at the Norwegian IBM User Group meeting in Larvik Norway, and several representatives from IBM Norway are here, as usual. Some of them had read my last blog posting, and came up to me and said that I had been a bit unfair and that they wanted to remedy my impression. So their suggestion was that I would, via a hybrid solution, be given the opportunity to test IBM Verse with my existing mail environment at work. This means that I will be able to give it a proper test, and have a full scale email environment for Verse to do it’s analytic work on. This shows that IBM, at least in Norway, are listening and engaging with their customers. That is something I really respect. I will do a new blog posting about Verse after testing it for a while. There’s a lot of people in the IBM user/partner community (in the old days lovingly known as the Lotus/Domino community) who have been asking one single question for quite some time now: Where is IBM heading? The big thing at the last Lotusphere in history, back in Orlando in January, was IBM Verse. 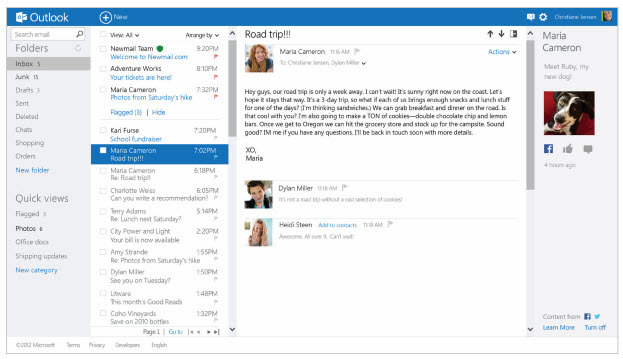 The new email solution that would blow all other email solutions out of the water. 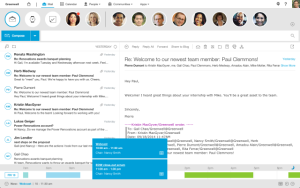 Then, after a few months, IBM Verse was opened in a beta release. To say we were underwhelmed would be an understatement. IBM Verse started out as IBM Notes 10, but the design team decided that improving the good old Notes client, which takes hundreds of gigabytes on your PC, was not the future. I agree wholeheartedly with that sentiment. Even if I have to say that Outlook 2016 is a really, really good client (I don’t care what you say, Outlook has never been a good mail client, but the calendar became good in Outlook 2010), there is no point in moving from one dinosaur to another dinosaur. The future of email is, as with most other collaboration solutions, in the web and with mobile apps. And if IBM want their customers to choose their email solutions and integrate it with their collaboration solutions, they must do something. Fast. Stay tuned for Part 2. I started the last day, slightly hung over, by being treated to breakfast by Panagenda. Not because they want me to buy the Marvel Client, but because we over the years have struck up a friendship. 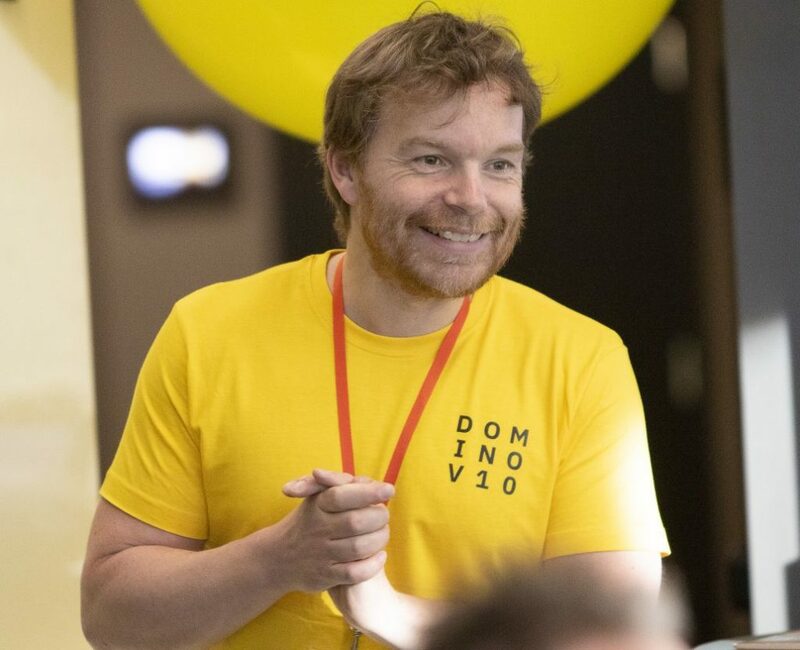 And that is one of the reasons this conference means so much to us in the Domino/Connections/Sametime community: You meet old friends again, in between all the sessions. Since I’m a developer focusing on GUI, and I’m a teacher and instructor, I like things to be consistent and recognisable to my users. And that includes IBM Connections. Which is why I‘ve skinned the Connections plugin. You can set up single signon via TAM, SPNEGO, SiteMinder etc. The most important thing I took with me was the security part. After this it was all set for something me, and most people there, are looking forward to: Gurupalooza. This is where the developers take the stage and everybody who wants to can come up to the mic and ask questions. The developers are IBM partners, OpenNTF-members (the Open Source site for Domino) or just people in the Domino/Connections/Sametime community that are considered experts in their field. The whole thing reeks of the fact that everyone vaguely knows everyone else, and there is a lot of laughing. I received an award for asking the first question and I got a yellow bicycle vest with Lotusphere 2000 printed on the left side. Nice! It was time for a session about plugins, something I myself handed in a draft for a session for. I didn’t get picked up, though, so I decided to visit the one that did get picked instead. The plugins in question are a the ones used for working with files in Connections from Microsoft Office, IBM Notes, Open Office, Microsoft Outlook, Microsoft Sharepoint or Windows Explorer. I’ve become quite the expert in utilising them and I’ve created both documentation and wikis about them. I must brag a bit: I was able to answer a few questions from the audience that the people giving the lecture couldn’t answer. Finally the developers asked me to meet them in the lab afterwards, so that I could show them how to create favourite links to libraries in communities. After the Plugins session I spent a few hours just talking with people in the community, as well as taking in lunch with a few of them. I also got a demo of some new features in ProjExec, a project module we are running in IBM Connections. It was then time for the closing session. It seems that IBM consists of nothing but Vice Presidents, and two women I’ve never heard of before came up to wrap up the conference. Even mentioning the fact that the Lotusphere cookie was missing form the lunch box this year! A lot of people have guessed that this would be the last Lotusphere (or whatever you want to call it) and that it would be absorbed by the annual conference in Las Vegas. However, the message we got was that we would be told in the coming months what would happen to the conference in the future. The session was closed with a fantastic sequence with mathemagician Arthur Benjamin. My guess is that he has ADHD and several other diagnoses, but he was a born showman, and showed what could be done with mathematics, given a bit of training. But I seriously doubt many people will be able to reach his level. You can see him in action at a TED-conference. And then it was over. IBM Norway treated us to a very nice farewell dinner, and after a few rounds in the karaoke bar Kimono at the hotel, it was all over. We stayed for a few days more and took in some sites in Florida. At the airport on Saturday, we ran into other Lotusphere-attendees and ha a final round of beers. See you next year? Today: Hogne learned splendid new things about content management, libraries and plugins for Office and Explorer. As usual there was a huge turnout for a Domion session. Most Notes/Domino sessions are very popular, since it’s the main reason people come to this conference, no matter what IBM claims. People are very anxious to hear if there is any point sticking to the platform or not. Since a bloated client that takes several gigabytes on your hard drive is not very fashionable any more, the idea is to move more and more of the functionality onto web and hand held devices. This will be done by separating data and presentation in a much better way. The data can still be stored in the .nsf-files on your Domino-server, but the presentation and manipulation of the data will be done on web or mobile. Writing and reading will still be done to the Notes datbase. With Bluemix IBM hopes to exploit this by integrating other systems and platforms. I wrote more about this in my previous blog posting. So you can for instance, via Bluemix, combine your Notes/Domino solution with SQL databases, php-systems and so on. In addition, you can still use an ID-vault and ID-files for encryption and signature support via Xpages on web. The possibilities are many, and I think most of our Notes solutions can be modernized in this way. In addition they will be available for you when you travel, and you can even set up offline syncronisation, like you’ve always been able to do in the Notes client. Luis Benitez is the product manager for IBM Connections, and I’ve been in a lot of contact with him in the past year (read: I’ve been pestering him). He and one of the developers did a great presentation that really inspired me. I’ve now learned how I can develop my own widgets for Connections. This makes it possible to present data from other sources into Connections, like a Notes database. I will test more of this via my own cloud account. And then we arrive to the part where I tell you why me and my colleague were so happy on this Tuesday. The conference had, as always, a lab where you can ask the developers of the various IBM systems questions, face to face. We are using CCM in Connections. It’s a small content management system that makes it possible to create libraries for files. We’ve had huge problems with this. We’ve not been able to create meta data and document types. This has all stranded in technical problems. We were able to create a form that popped up every time someone wanted to upload a file to a certain library. We wanted them to be able to fill in meta data like production number, thruster type and so on. This can then be used to organise and search for content. After a talk with the main developer of CCM Gunnar, my colleague, managed to fix this. He was so inspired that he ran straight to his hotel room to finish the solution. And it works. Beautifully. And: The form asking for meta data also appears when you upload files via the Office and Explorer plugin for Connections! Tears of joy were falling. Beautiful! Speaking of plugins: These are constantly developed by IBM, and I was able to talk to the chief developer. We will now have offline sync for files in Connections 5.0, via the Office and Explorer plugin. In the newest version of the plugin, you are also able to check files in and out, directly from Office. I was also told that there would be no more development for the plugins in Notes. Så those of you who have, like me, dreamed of file tagging in the Files plugin in Notes can just forget it. Darn that IBM Verse! I also talked to him about a problem where my users get an error message when trying to drag certain emails from their inbox and into an activity in the Activties plugin in Notes. Has anyone else of you experienced this? Any tips or help is appreciated. This was a very interesting session. It was a non technical session, because it was simply about the organisational challenges you face when converting to a social business. They presented us a survey done among 20 large companies on what their experiences were. And I must say I nodded in recognition to a lot of the things that was presented. 2,5% of employees are often the ones that take the lead when it comes to introducing social solutions, like IBM Connections. They are impatient, and you can’t even train them, because they are ahead of you, finding every strength and weakness in the system. 13,5% are what we call early adopters. They immediately grasp what it’s all about and they see the possibilities and start their adoption right away. About 34% of the employees need more prodding to be convinced. They usually turn into team players after being trained and have to be able to see it work in real life. The final 16% you should just give up on. You cannot persuade them, and they will use any trick in the book to get around the system and keep working “like we always have done.” It is important, though, not to force them. Remember that it should be fun! This session was about how to upgrade to Connections 5.0 and best practices around this. Even if my company will be using consultants to do this, it was very useful for me to get an overview what it really will entail. I also got hold of documentation. This was a very technical session, with a lot of abbreviations and strange jargon. Both me and Gunleif, who administer the Domino servers with me, were pretty tired afterwards. It was a very thorough walk through on how to secure your Domino servers to minimise the danger of attacks via the web. Gunleif and me concluded that we will go through our web servers when we get home, and of course install all the latest Fix Packs. In addition I learned that you now longer need a Windows XP PC to generate keyring files. Hurrah! Most companies, mine included, have a lot systems with employee data. The problem is that they all must be maintained manually. We want this to happen in the HR system, and then be replicated to Active Directory, then to Domino and further onto Connections and other systems. This session was more of a discussion on how to achieve this, with a special focus on Active Directory and Domino. This will not just be about technical solutions. It’s just as important to have the organisational bits in place. When a users is created she must be added to a group which reflect the access she should have. This will be based on which department she is a part of. Only after all this is in place can you start with the technical side. How much of this we will be able to do at my company, we don’t know yet. The job has to be done, and I talked to an expert on Tivoli Directory Integrator, a system you automatically get via your Domino license. He was from Norway, and he felt that everything I wanted should be able to be scripted in TDI. Because of winds that made the fountains blow the water horisontally IBM moved this year’s beach party indoors. We had good food and drinks, once again, and it turned into a late evening with good talks, exchanges of experience and the establishing of new contacts.